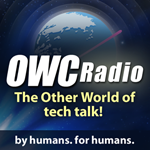 Today, Other World Computing has launched a new audio podcast, OWC Radio. Hosted by Tim Robertson, the first episode features an interview with TUAW.com tech writer Steve Sande. Subscribe to OWC Radio in iTunes here! OWC Radio Host Tim Robertson (OWC Tim) has been a long time staple in Macintosh podcasting, having hosted the MyMac.com podcast for the last five years. One of the original Mac podcasters, Tim will bring his passion for the Macintosh and iPhone to the OWC Radio podcast every week, taking a look at the biggest Mac stories on the web. OWC Radio will be an ongoing audio program, free of charge, that you can subscribe to in iTunes. Or, if you prefer, click here to listen to the show right in your web browser. Please be sure to follow OWC Radio and show host Tim Robertson on Twitter at www.twitter.com/owcradio, and send feedback to podcast@macsales.com.